“We have used Gordon Levet’s Kikitangeo highly worm resistant, easy care Romney rams for a number of years and are finding the survival rate of our sheep improving with minimal drenching. Adult sheep are never drenched and lambs are drenched at weaning and an autumn drench when required. Kikitangeo rams are hardy (coming off extremely difficult sheep country), have excellent feet and top quality wool. Lambing percentage is 130% (ewes to the ram) with low labour inputs. We have no hesitation in recommending Kikitangeo Romney rams”. “In 1997 we made the decision to purchase Kikitangeo Romney rams, bred by Gordon Levet, for use over our Romney flock which we farm here at Hukaroa Station, strong hill country in the North Waikato. We were looking to continue our eczema tolerant programme and build into our breeding programme, worm resistance. We believe that Kikitangeo rams have assisted the goals of our breeding programme immensely. Together with their eczema tolerance and worm resistant traits, Kikitangeo rams are hardy, stand on very sound feet and their offspring produce a great fleece. All our wether lambs are sold as stores at the Tuakau Saleyards, at their annual lamb fair. 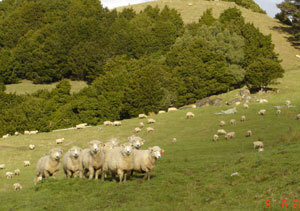 They are keenly sought after, often topping the sale and our ewe hoggets also top the Tuakau ewe fair. We have no hesitation in recommending Kikitangeo Romney rams, and believe we are very fortunate to have the sound advice and knowledge from such a dedicated breeder as Gordon." “I have purchased Kikitangeo rams from Gordon for over 40 years. They have been systematically bred to overcome the difficulties faced in sheep farming in Northland conditions where humidity, drought and excessive rainfalls nurture parasites, eczema and poor feet. Firstly, through ruthless culling, his sheep are structurally sound and durable, and over the years, he has developed worm resistance, disease resistance, sound feet, eczema resistance, high lambing percentages and easy care lambing. I believe that this stud’s rams are the best you can purchase for excellent animal health, with minimal intervention, producing ewes which breed lambs of outstanding early weights." "We have been using Gordon Levet’s Kikitangeo rams for 28 years. We buy Gordon’s rams because of the effort he puts into breeding structurally sound and correct Romneys with top fertility. From the feet up (no foot rot at all) the sheep are basically easy care, produce well and thrive in a difficult climate. By using solely Kiki rams for our replacements, we have never suffered an outbreak of eczema in a high risk area, and lately, have come to value the extra genes for proven worm resistance in his rams. As an honest studmaster for over 50 years, it would be hard to find someone else who is so focused on improving stud performance each year – for me, as a buyer, the benefits are great for my flock and income."